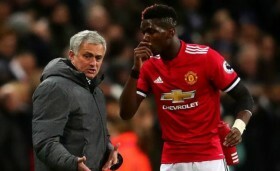 Manchester United are reportedly prepared to sanction the sale of midfielder Paul Pogba at the turn of the year with the Frenchman considered a divisive figure in the club's dressing room. The France international has struggled to make a meaningful impact during the course of the current campaign and this has witnessed him fall down the pecking order under manager Jose Mourinho. Amidst this, there has been the regular speculation that he could part ways with the club and The Mirror claims that could be the case when the transfer window reopens. It is added that the hierarchy are planning the midfielder's sale regardless of whether Mourinho stays or not with the Frenchman said to be influencing other players with his mindset. Pogba was an unused substitute for the second Premier League game on the bounce on Sunday where the Red Devils suffered a gruelling 3-1 defeat at the hands of arch-rivals and table-toppers Liverpool.